The Wabbit hopped closer and closer and just as Cardinal Lapin was about to reach the recreation area, he grabbed him by the arm and propelled him through a window onto the prison roof. The shadows hovered threateningly, but appeared reticent to advance near the low wall that marked the edge of the building. 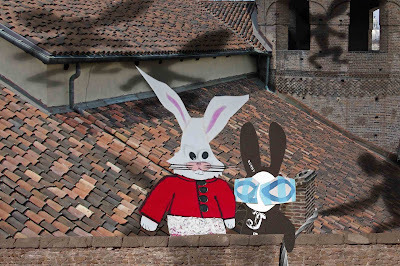 The Wabbit took Cardinal Lapin firmly by his robes and pulled him to the parapet. "I won’t be a second," he murmured. He delved deep in his fur, pulled out a long rope and attached it to a small chimney. Then he threw the rope across the wall. Cardinal Lapin looked over and watched the rope coil down further and further. He turned and stared at the Wabbit. "Who? Me?" he gaped. "It’s a rope trick," said the Wabbit. "The shadows will watch the Cardinal and the rabbit vanish!" "That trick is usually going up, Wabbit. Not plunging down," said the Cardinal. The Wabbit heard the sinister sound again and snatched a glance over his shoulder. "It’s the rope or the shadows!" he yelled. "We’re losing a head start. Over you go!" "There’s supposed to be a secret wire in this trick," fussed Lapin, looking over the edge again. "I don't see the secret wire!" The Wabbit smiled and shrugged. "Secret wire?" he scoffed. "Do you think I’m a charlatan?" And he shoved Cardinal Lapin over the edge and down the rope.